What is Clear Correct? Is it right for me? Are your teeth crooked, gapped or crowded? Would you like to achieve a beautiful, straight smile, but you don't want to spend months in embarrassing traditional metal braces? If so, then Warrenton dentist Jeffrey A. Harris, D.D.S. has just the solution for you: Clear Correct. Clear Correct is a clear braces alternative that offers nearly all of the benefits of traditional metal braces without all of the drawbacks. Most importantly, Clear Correct allows you to get the beautiful smile you've always wanted without having to spend months stuck in unsightly metal braces. Clear Correct from Dr. Harris in Warrenton works in a similar manner to braces, except that it uses clear aligners instead of metal wires to gradually shift your teeth. Wear each set of aligners for at least 22 hours a day and switch to a new set of aligners as often as recommended by your dentist. Over time, your teeth will gradually shift into their new positions as each subsequent pair of aligners bring you closer to your goal. What Advantages Does Clear Correct Offer? The main advantage Clear Correct offers is simply that it is clear. No longer do you have to worry about showing off a mouth full of metal; with Clear Correct, no one has to know that you are wearing aligners but you. 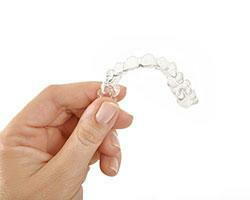 Clear Correct is also removable, easier to clean than metal braces, and made in the United States. Is Clear Correct a Good Option for Me? Many of Dr. Harris's Warrenton patients have already used Clear Correct with great results. Could you be next? If you want a beautiful smile without sacrificing your looks in the meantime and you can be responsible enough to wear your aligners as often and as long as you should, Clear Correct may be just the treatment option for you. Only a qualified dentist can let you know if you qualify for Clear Correct for sure, however, so call Dr. Harris to set up a consultation today. Your beautiful, straight and vibrant smile may just be closer than you realize!